What’s cooking week four of the farm share? We put a good dent in the farm share on pickup night last Thursday with our delicious dinner, then took the cabbage and remaining kohlrabi to Brian’s parents. We made a simple cole slaw, shredding those items along with some grocery store carrots, mixed with a generous amount of mayonnaise. My mother-in-law was intrigued by the the kohlrabi, but apprehensive about serving it at a cookout for her family of somewhat non-adventurous eaters. “Just don’t tell them what’s in it,” she cautioned. Until people gobbled it up at dinner. Then she asked me to break the news that they were eating something exotic. We sauteed up some zucchini Sunday night to stuff in pita bread with goat cheese and pesto for lunch Monday. Monday night we tackled the chubby green squash called Cousa. Cousa is a Lebanese summer squash — the name means squash in Arabic. 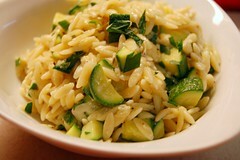 I based an orzo dish on Barbara Kingsolver’s Disappearing Zucchini Orzo (download recipe), using shredded fontina in place of parmesan (because that’s what I had). I also cubed the squash instead of grating it. It’s only July, I don’t want to hide my squash in the meal yet! We also made a salad of the lovely, silky May Queen lettuce. I’ve never seen such soft lettuce. 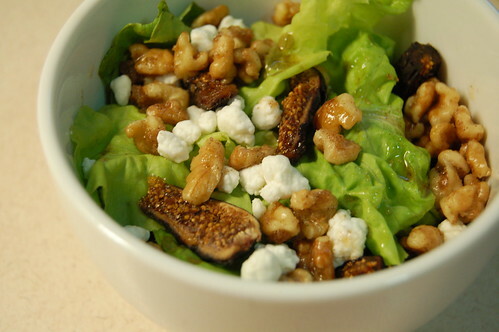 I dressed it simply with a homemade vinaigrette of peach champagne vinegar, balsamic vinegar and sunflower oil, and tossed it with figs, goat cheese and candied walnuts (toasted on the stovetop with butter, sugar cinnamon and a bit of cayenne). I wish I’d picked up two heads up lettuce so I could’ve had this for lunch the next day. We ate out Tuesday night. I was putting off the beets. I’ve had beets precisely once in my life. I had a borscht soup in St Petersburg. I recall that I liked it, but that made up the extent of my beet knowledge. My bunch of beets had lain in the crisper all week, forlorn little mouse-looking things reminding me every time I opened the door that I still had to come up with something great to do with them. Tonight was the deadline, as our next pickup is tomorrow. Google turned up this recipe for Roasted Beetroot Rice Pilaf with Za’atar which sounded quite good, and easily adaptable to meet the ingredients I had on hand. I’ll confess right now. I did not like the beets. Not at all. Perhaps they’re an acquired taste, but I found them most unpleasant. For all that they’re on the New York Times list of The 11 Best Foods You Aren’t Eating, I think I’ll pass from now on. However, the rice dish itself was quite good, and I think I’d like it with any number of other vegetables. Here’s how I made my version. Slice the beets, toss in olive oil, salt and wrap in aluminum. Roast in the toaster over (I don’t turn my oven on in the summer) for about 45 minutes on 400. Meanwhile, start a pot of mixed-grain rice in vegetable broth with a cinnamon stick in the pot. Zest and juice a lemon. Toast a handful of almonds. Sautee a couple garlic cloves in some olive oil. Add the lemon, spices and almonds to the garlic and stir well. Chop a few dried figs. When the rice is halfway done (still too firm to eat, but noticeably softening up) pour, broth and all, into garlic and spice mixture. Add a bayleaf and the figs. Stir and simmer, adding water as needed. 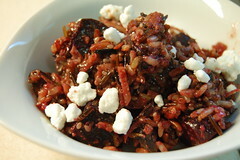 When the beets are tender, mix into rice. Pick the beets out (if you’re me) and enjoy. I’m with you on the beets, Dana, but I have to admit: those photos make everything look very, VERY tempting! I’m sorry you dont like beets… but if you want to try again sometime… this is my favorite and easy recipe. Peel raw beets and grate. toss with lemon juice and extra virgin olive oil, add salt and pepper, could add fresh ginger… chill. Beets are fabulous but you’re right that they must be a taste you’ve yet to acquire. Raw beets slices in matchstick sized pieces go well on top of a salad. Roasted (in the oven, I don’t own a toaster over) with other root vegetables like carrots and potatoes and fennel is a wonderful side dish.